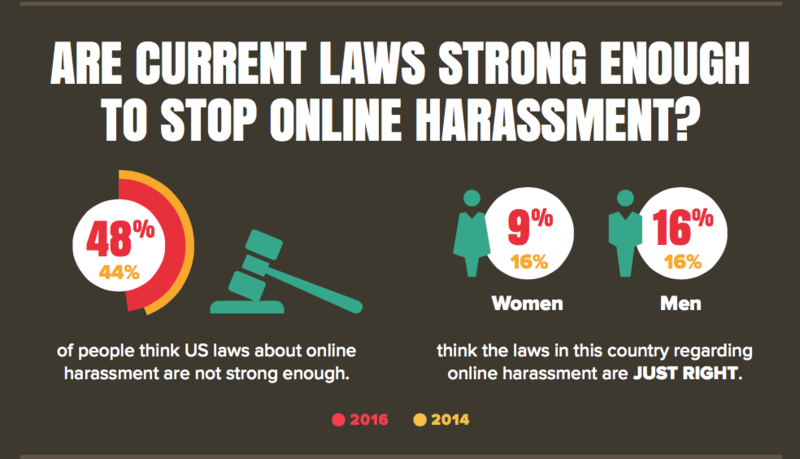 Online harassment has been an ongoing problem since the dawn of the Internet despite efforts to curb it, particularly in the last year by Facebook and Twitter. New poll data in the form of an infographic was just released in partnership with Rad Campaign, Lincoln Park Strategies, and my community initiative, craigconnects. The poll reveals that there hasn't been much of a decrease in online harassment since 2014. This poll is a follow-up comparison to the online harassment national poll we conducted in 2014 to see how things have changed. This side-by-side observation illustrated that both social networks and individuals have a lot of work to do. Social networks like Facebook and Twitter are working hard to address online harassment but it's a difficult problem to solve on many levels. It needs to be addressed legally and through tech. But tech and legal alone won't solve online harassment. There needs to be a culture change in how we talk to each other online and all of us have to be a part of that and be accountable. In this political climate it's no surprise that political harassment has increased since 2014, given the highly contentious election season that we're experiencing. It's no surprise that political harassment has increased since 2014, given the highly contentious election season that we're experiencing. What is surprising? Baby boomers experience political harassment more than any other generation. 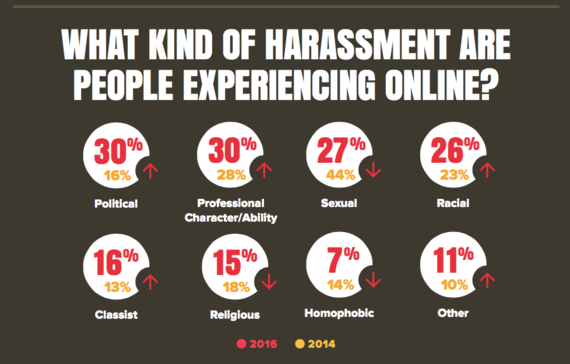 More than 3/4 of adults ages 55-64 harassed online experience political harassment (79%). Why do you think this is the case when millennials are the generation harassed most often online in general? People online say they are harassed the most on Facebook. 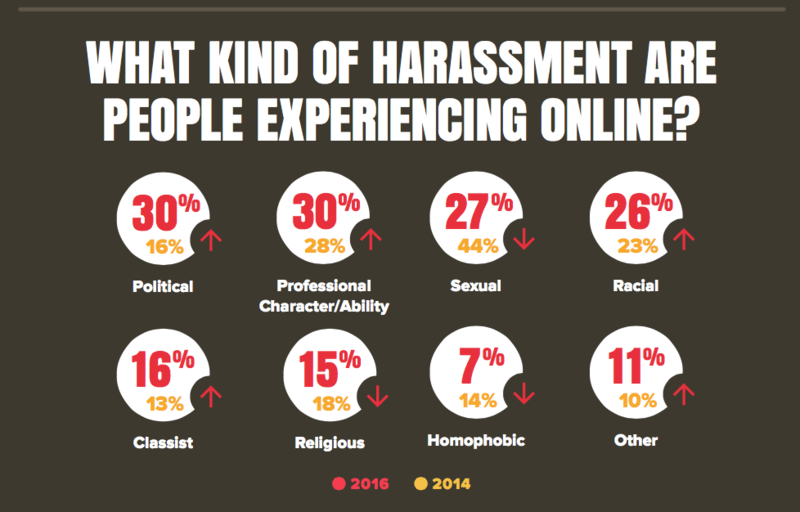 More than half of online harassment is happening on Facebook (63%). Overall, younger people are harassed more than older people. 47% of millennials have either personally experienced harassment, or know someone who has. This percentage remains unchanged since 2014, despite policies implemented by social networks to address this. Tinder users report the highest levels of online harassment. 62% of daily Tinder users ( ¾ of whom are millennials) say that they've been harassed online. Women are harassed more than men. Of adults who reported harassment in 2016, 55% are women; 45% are men. The number for women is slightly down from 2014; for men slightly up. Harassment via email has increased. Email certainly isn't dead. As more people use email daily, email harassment has risen from 20% to 25% from 2014 to 2016. This is some pretty timely data, especially with what was going on with Ghostbusters 2 star Leslie Jones and her terrible experiences with online harassment, particularly racist and sexist hate speech. In an interview with Seth Meyers, Jones said she teamed up with the CEO of Twitter to get several accounts shut down. Unfortunately, Twitter has received some criticism for not being as timely in their response to the harassment as people would have liked. "While there are a few pieces of good news in the data, overall we still have a long way to go to solve this pressing problem," said Stefan Hankin, President of Lincoln Park Strategies. "Given the amount of attention that this issue has received over the past couple years, we would expect to see more dramatic shifts in the numbers, but that was not the case. If companies and individuals are looking to truly solve this problem, we are going to need to rethink our approach." Meanwhile, as social networks are working to address online harassment on their platforms, it's also up to all of us, as users, to do our part to report bad actors and to encourage civility. 'Treat people the way you want to be treated' applies online, just as it does in the real world. I'd really like for folks to comment with their suggestions for social networks, and what can be done to stop or drastically reduce online harassment. What's your take?